Once a jackal was very hungry as it did not get food for many days. While searching for food, the jackal reached a town. Once the jackal entered the town, he was greeteed by a pack of ferocious dogs. The dogs began chasing the jackal. The jackal ran for its life and finally jumped into a big drum. The drum was filled with a blue dye and hence when the jackal finally came out, it became a blue jackal. Jackal went back to the safe heaven of forest. When other animals saw the jackal, they could not recognize him because of blue color. They thought that it must be a strange and powerful animal. All the animals bowed to the jackal and pronounced him as their king. The jackal was very pleased to become the king of the jungle. The lion and tiger were always at his service. They used to bring freshly killed prey for the jackal. Thus, the life was going quite smoothly for the jackal. 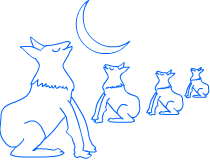 On one night, all the animals were sleeping near the abode of blue jackal. Suddenly the blue jackal heard the howling of another jackal. It was natural for the blue jackal to howl in answer. He tried to control his urge but it was so strong and natural that he could not help but begun to howl in a high tone. When other animals heard a recognizable voice, they could understand that it was a jackal under the blue coat. The animals became very angry and thrashed the jackal blue and black. The moral of the story is, “You cannot change your natural ways by changing your getup.